Use your fabric scraps to make yo-yos while you watch TV or wait in the car. 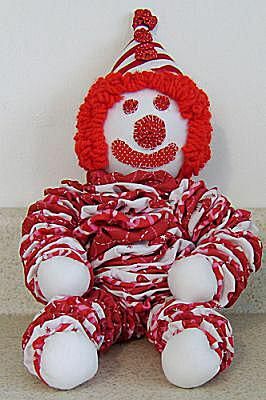 Then transform those yo-yos into a safe, fun yo-yo clown project for a great toy. Note: Throughout the directions, you will see what may seem like repetitious steps involving sewing and knotting the same area numerous times. These steps and the knotting will serve as a backup in case a thread should break or come undone as a child plays with the toy. Please be sure to knot and tie securely as you sew this toy. Sew yo-yos using the basic yo-yo directions (or the Clover Large Round Yo-Yo Tool for the 4 1/2-inch circles). Turn under the edge of the head circle and sew a running stitch as if you were making a yo-yo BUT before closing the circle, stuff the circle into a disk-type shape. Pull the thread to close the circle on the back of the head. Knot and tie off well. The closure area will be hidden with the clown "hair" before you are finished. Use straight pins to place the eyes, nose, and mouth. Sew the eyes and nose in place using a blanket stitch, bringing the thread to the pieces from the back of the head and knotting off at the back of the head. Cut a mouth shape from a scrap of fabric with fusible web on the ​backside. Fuse the mouth in place and sew a blanket stitch around the edge. Hand sew chain stitches to hold the yarn together. Remove the "hair" from the knitting needle and arrange it on the head working from around the face to the back of the head. Hand sew the hair in place, stitching from the chain stitches to the head. Fill in the head with "hair." Sew and knot securely! Unraveling yarn could be a strangling danger. Stack the body yo-yos in the desired pattern. Thread the needle with a long length of thread and knot leaving a thread tail after the knot. Starting at the bottom, with the gathered part of the yo-yo facing the bottom of the stack, insert the needle into the center of the yo-yo, stacking yo-yos on the needle. Continue stacking the body yo-yos until you reach the top yo-yo. Turn the top yo-yo over so the gathering is facing the top of the stack where the head will be attached. Pull the thread tight and knot off in the center of the top yo-yo. Sew the head on securely by sewing around the bottom of the head attaching it to the to yo-yo. Knot off occasionally as you sew on the head so that it will stay attached if any part of the thread were to break. Reinforcement is essential to prevent any choking hazards. At the side of the head, guide the needle back down through the stack of yo-yos. Knot off and guide the needle to the other side of the yo-yo, aligning the needle with the other side of the head and guide the needle up through the yo-yos to the side of the head. Knot off. Repeat at the front and back of the head so that there are five threads going through the body yo-yos. Turn under the edge of a hand circle and sew using a running stitch as you would when sewing a yo-yo. Stuff the circle and then draw the thread to close the stuffed circle. Stack the arm yo-yos using 21 yo-yos for each arm. Starting with the gathered side of the bottom yo-yo facing the hand, sew the hand to the center of the bottom yo-yo. Guide the needle up through the center of the arm yo-yos, turning the top yo-yo so the gathered side of the yo-yo is facing up. Sandwich the top two arm yo-yos around the second body yo-yos at the side of the body. Sew the arm yo-yos to the body yo-yos. Sew the top body yo-yo to the top arm yo-yo, hiding the stitches inside the body yo-yo. Knot the thread under the arm attachments. Guide the needle down through the arm yo-yos. Knot the thread at the top of the hand. Guide the needle up through the arm yo-yos so there are three lines of thread attaching the arm yo-yos. Turn under the edge of a foot circle and sew using a running stitch as you would when sewing a yo-yo. Stack the leg yo-yos using 21 yo-yos for each leg. Starting with the gathered side of the bottom yo-yo facing the foot, sew the foot to the center of the bottom yo-yo. Guide the needle up through the center of the leg yo-yos, turning the top yo-yo so the gathered side of the yo-yo is facing up. Sew the top leg yo-yo to the bottom body yo-yo, to one side of the center of the yo-yo. Secure well, knotting after every couple of stitches. Guide the needle up through half of the body yo-yos. Knot off on the body yo-yo and go down through the body yo-yos to the leg. Fold the 9-inch circle in half with the right sides together. Gently roll the half-circle into thirds. Slip stitch the overlapping outer fabric to close the hat. Finish the bottom edge of the clown hat with a machine-sewn satin stitch or by enclosing in double-fold bias tape. On the top of the hat, sew three yo-yos together, sewing through the center of the yo-yos, sandwiching the top of the hat to form the top pompon. Stagger the other two pompon yo-yos on the front of the hat and sew them in place knotting securely inside the hat. Gently stuff the hat to help it hold its shape. Place the hat on the clown head and sew in place, knotting after every few stitches to securely hold the hat in place.